Don’t pay those high booking fees through 3rd party websites. 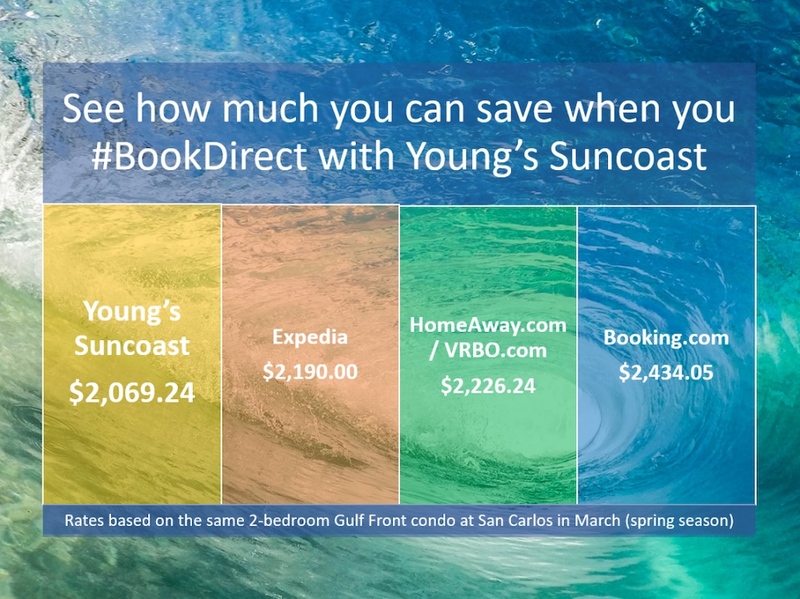 When you #BookDirect with Young’s Suncoast you’ll save anywhere from $100 – $400! It’s like #ShopLocal – but for your vacation! Avoid unnecessary fees and 3rd party customer service from booking sites while getting cheaper rates and first-class service from our team at Young’s Suncoast. Search available Gulf Coast rentals today or call us at 1-800-826-1213 if you want us to help you build out the perfect vacation deal for your stay! Check out the current vacation deals we have going on. See how much you can save when you book your vacation stay directly with us.